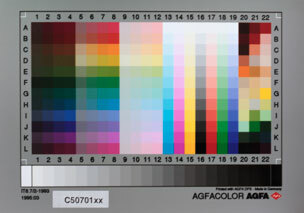 A color chart for calibrating and profiling film and photographic print scanners. The IT8.7 chart is available in 3 formats designated by a "/1", "/2" or "/3". The IT8.7/1 is a transparency, available in a 4x5 inch and 35 mm film format. The IT8.7/2 is a 5x7 inch photo print. The IT8.7/3 is a differently designed chart for printers. The IT8.7 chart is to extract a large amount of data about the photographic medium and the scanner's ability to measure this information. There are a maximum of 288 possible patches for the chart. Rows A to L, Columns 1 to 13 represent 12 hue angles in the CIE L*C*h space, with 4 chroma steps, at three lightness levels. Columns 4, 8 and 12 are the maximum chroma possible at the given hue angle and lightness value. Columns 13 to 15 are the three fundamental dyes in the photographic medium at 12 density levels. Column 16 is all three dyes combined equally. Columns 17 to 19 are the equal combinations of the dyes taken two at a time. Row L in these columns represents the maximum dye density possible. Row A is the minimum detectable dye density. Columns 20 to 22 are a vendor defined area. Each vendor can put anything in this area. Kodak puts a facial image in part of it with 12 additional flesh tone patches. 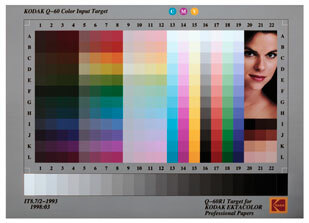 A 24 step grayscale is located along the bottom of the chart. Patch GS0 is the minimum dye density possible, patch GS23 is the maximum density black possible. The allowed tolerance for each defined patch is 5 CIE 1976 ΔE.